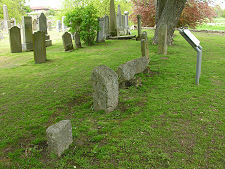 A cemetery beside the B993 at the southern end of Inverurie is home to relics of two very different but equally fascinating historical periods, while a reminder of a third can be found just a hundred yards away. 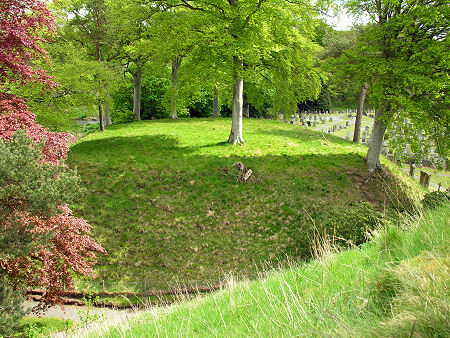 Here a well preserved medieval motte and bailey can be found close to a line of Pictish symbol stones, while nearby is the cairn marking the site of the Battle of Inverurie. 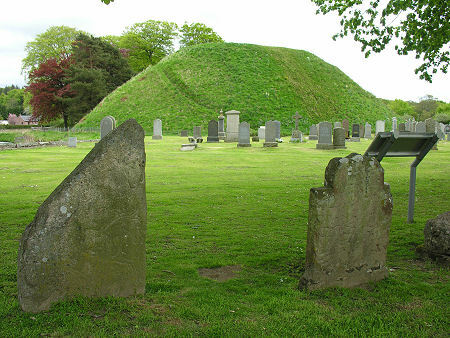 Anyone driving past the cemetery will inevitably notice two very large mounds projecting above the gravestones. 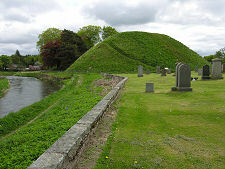 These are together known as the Bass of Inverurie, and supported the motte and bailey castle built by the Earls of Garioch in the 1100s. The castle here was used as a base by Robert the Bruce before his defeat of the Earl of Buchan in May 1308 at the (first) Battle of Inverurie, a battle often known - because it was fought several miles north east of Inverurie near the Hill of Barra - as the Battle of Barra. A steep path today climbs up the 16m high motte, and from the top you can appreciate part of the reason it was built here, right on the banks of the River Urie. Less obvious because of more recent development, and the railway in particular, is that the Bass is also very close to the banks of the River Don, and that it commanded the confluence of the two rivers, only a short distance to the south. 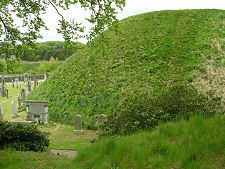 The top of the motte is probably the best place from which to gain an appreciation of the size and shape of the bailey, which extends to its east. Originally the upper edge of both motte and bailey would have been surrounded by a wooden palisade. Access would only have been possible to the bailey, which would have contained a series of wooden buildings housing the castle's domestic functions. From here a bridge would have given access to the motte, which within its palisade would have held the castle's wooden keep. These early motte and bailey castles were very common across Scotland, but either disappeared without trace, or were developed into later stone castles. The Bass of Inverurie is unusual in doing neither. A little to the west of the Bass but still within the cemetery, a line of what at first appear to be gravestones but are not. Several of these turn out to be Pictish symbol stones which were built into the walls of the medieval church which once stood nearby and served the community which would have built up around The Bass. 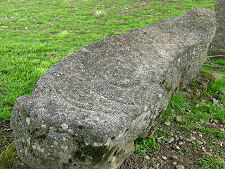 When the church was demolished the stones, which are all fragments, were recovered and placed here. The largest is lying down and carries parts of four worn symbols. 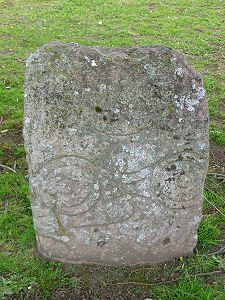 The smallest stone is at the end of the row, and is adorned with part of a mirror symbol. 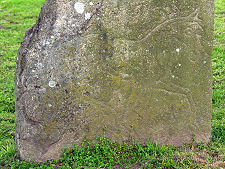 An upright oblong stone, known as Inverurie 3, carries the most complete symbols, while the most northerly of the stones, Inverurie 4, is irregularly shaped and carries the beautiful engraving of a horse. 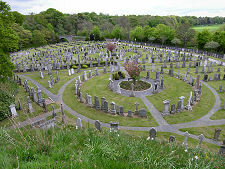 Parking near the cemetery is not easy, and the best place to park is probably a little way back towards Inverurie, where there is a parking area at the northern end of some open land on the banks of the River Don. 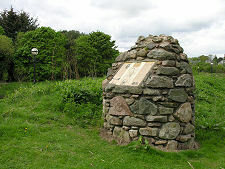 Walking from here to the cemetery reveals this part of Inverurie's third historical attraction, a cairn marking the site of the (second) Battle of Inverurie. This was not the Battle of Inverurie fought in May 1308. Rather it was the battle which took place over four centuries later, on 23 December 1745, when 1100 Jacobites defeated 500 Hanoverian troops in what was to be the third-last battle to be fought on British soil.